Wing span: 3 - 4 inches (7.5 - 10 cm). Identification: Upper surface of forewing is mostly black with ivory spots along margin. Upper surface of hindwing has orange spot on costal margin and sheen of bluish (female) or bluish-green (male) scales. Underside of hindwing with pale green marginal spots. Life history: Males patrol in woods, roads and woodland edges to find receptive females. Females lay single eggs on underside of host plant leaves. 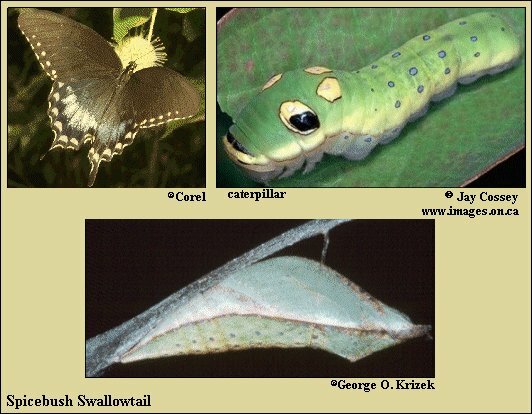 Caterpillars live in shelters of folded-over leaves and come out to feed at night. Some chrysalids from each generation hibernate. Flight: 2 generations per year from April-October. In Florida, several generations between March-December. Caterpillar hosts: Spicebush (Lindera benzoin), sassafras trees (Sassafras albidum); perhaps prickly ash (Zanthoxylum americanum), tulip tree (Liriodendron tulipifera), sweetbay (Magnolia virginiana), camphor (Cinnamomum camphora), and redbay (Persea borbonia). Adult food: Nectar from Japanese honeysuckle, jewelweed, thistles, milkweed, azalea, dogbane, lantana, mimosa, and sweet pepperbush. Habitat: Deciduous woodlands, fields, roadsides, yards, pine barrens, wooded swamps, and parks. Range: Eastern states from southern Canada to Florida; west to Oklahoma and central Texas. Occasionally strays to North Dakota, central Colorado, and Cuba.